Overcrowding reached an "acute level" on the Borders Railway in the run-up to Christmas, according to campaigners. The Campaign for Borders Rail (CBR) said passengers were unable to board "packed trains". 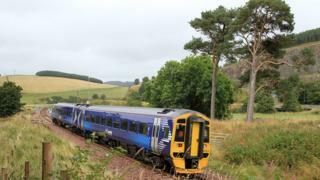 It said that was "hardly a good way of encouraging rail travel in Midlothian and the Borders". ScotRail said it knew performance had not been good enough but it was "working flat out" to improve services on the Edinburgh to Tweedbank line. CBR committee member Robert Drysdale - who collated performance data - said trains with insufficient carriages or service cancellations were still being experienced by "long-suffering" passengers. The organisation stressed that it recognised problems with overcrowding were not confined to the Borders Railway and had been experienced across central Scotland. "CBR will continue to campaign for better services on the Borders Railway," said Mr Drysdale. "At the same time as pursuing the aim of securing extension of the line through the Borders to Hawick and Carlisle, it is clear that formation of a 'users group' of regular passengers would be a big step forward. "Such a group, with members who are all travelling on the line frequently, would be in a strong position to monitor train capacity and operational problems, and take up these issues with ScotRail, assisted where appropriate by CBR." A ScotRail spokesman said it was working hard to tackle the issue of overcrowding. "We know some of our customers in the Borders have been frustrated by the service they have received from us in recent months," he said. "Our performance hasn't been good enough, we understand that, but things are improving. "We know that one of the biggest concerns for our customers is busy trains, and we do all that we can to meet the increasing demand. "Everyone at the ScotRail Alliance is working flat out to deliver the level of service our customers expect and deserve."